Honda was one of the highlights of the 2017 Tokyo Motor Show, even if I still came away a little disappointed. Their duo of EV concepts, for example, the Urban EV Concept—first seen at this year’s Frankfurt Motor Show—and the new Sports EV Concept were two of the coolest cars at the show. 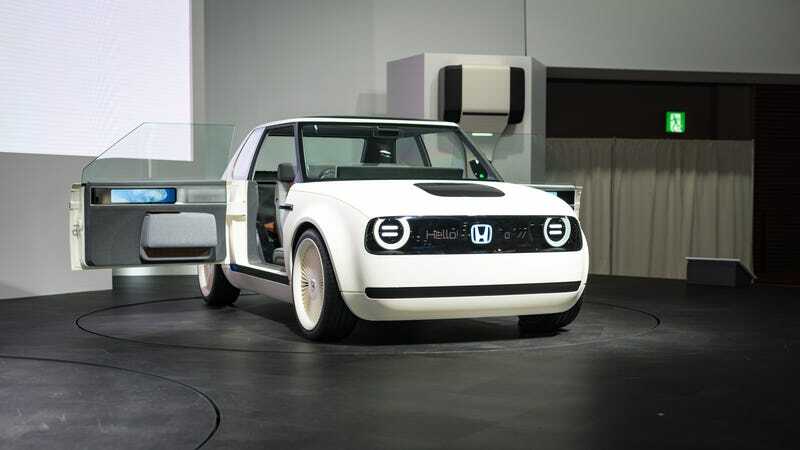 And, sure, it’s hard to get excited over EVs, but the pair of concepts from Honda were too good to dislike. If Honda can make EVs interesting then surely everyone else can too? It boggles the mind why no other manufacturer has gone down the retro-chic look like the Urban EV. The funky and quirky design that harks back to the first-generation Civic is just cool. The best thing, though, is that this isn’t some weird design exercise that’ll never make into production. Honda has confirmed it’ll go on sale in Europe before 2020, followed by sales in Japan. Here’s hoping the design of the production car stays true to this concept. Unfortunately, I doubt some of the cooler elements of the concept will make into production, like the bench seats and the suicide doors. But I’m happy to be proven wrong if you can make a mass produced city EV with suicide doors. There was no mention on when the Sports EV would go into production but they did say it would share the same platform as the Urban EV. It looks like a squashed version of the Urban EV anyway. That’s not to say it’s a bad looking car, quite the opposite in fact. But there was less of a wow factor with the Sports EV, though the 8-bit display on the front grille could provide a lot of opportunities for fun. Much of it had to do with it looking so similar to the Urban EV, which came out of nowhere at the Frankfurt Motor Show. The Sports EV was teased a couple weeks before the Tokyo Motor Show and from the teasers we were able to predict the design. I don’t dislike it. It’s just, I was hoping for something more stunning. I dig the proportions, and the long bonnet is a nice touch for an EV. It just looks good. But I’m not so sure on the holes in the bonnet; I assume they’re there for aero otherwise they look quite odd. Where the Urban EV is reminiscent of the first-generation Civic, the Sports EV reminds me of the old S600 Coupe. This is one of the concepts from Tokyo that I genuinely hope will go into production. It may not be a S2000 successor but any cool new sporty car from Honda is a win for everyone, even if there’s no VTEC. I was surprised Honda didn’t have their new Sports Vision Gran Turismo Concept car at their stand this year. Having been announced for the video game just a couple weeks ago, it would’ve been nice to see the concept in real life but perhaps they’re saving that for another show. Tokyo Auto Salon maybe? Honda also had the NeuV Autonomous Concept first seen at CES 2017. It signals Honda’s commitment to autonomous cars in the future as well as more connected cars, whatever that means. The backwards Koenigsegg-style doors were very good. But while EVs took center stage at Honda this year, they’re still committed to fuel cells. The Clarity plug-in hybrid was also there to remind people fuel cells are still a thing and Honda believes in their future. Though a plug-in hybrid FCV is quite a neat idea. The batteries are expected to last around 40 miles on top of the 360-mile fuel cell range. Elsewhere, there was a special edition S660, painted in beige. I’m not sure why, but there you go. In the press briefing there was also a mention at their “disappointment” in the current F1 season but are “looking forward to working with their partners”. Sounds like a bitter divorce to me.